If you think the love of money is the root cause of evil, you’re only half there. The Christian world-view is initially formulated from the Old Testament, the primary source of understanding human nature and the world around us comes from the first book Genesis in which the first stories relate to the creative acts and mankind’s Fall. Pride is the root of evil. The love of money is only one manifestation of this evil. I use comments and questions from a writer at the Facebook group Christians Against Usury as the basis for this post. Enjoy! I’ve recently crossed swords with a US author and activist online [DK] whom I have challenged to go deeper than his current teaching, so far unsuccessfully. 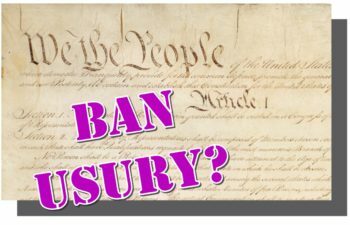 The essence of my advice is that while highlighting the biblical prohibition on usury (the charging of interest) is much needed, proper understanding and meaningful change will never come unless we understand the authority behind the power to enforce usurious practices. UAC’s position is that mankind has the scriptural guide on financial matters, so we simply need to teach all, then vote to add in an amendment to the Constitution making usury illegal and bingo, blessings will occur in ‘the land of the free’ – all will be well – actually national salvation will occur. I presume that the world begins and ends in the US of A and that we should all do the same in our neck of the woods too. OK that’s a little tongue-in-cheek paraphrasing but it’s the essence of their position – using political power to do God’s work. Mine is that God created and gave freewill choice to mankind. We screwed up and got our just deserts. Yes, God has indeed given us the blueprint for godly/wise living, and Jesus exemplified this for us. DK & I differ from then on because my take is that democracy (lit: power of the people) got us into the mess we are in; democracy has no place in His plans for His creation moving forward (indeed is just as accursed as usury is) and that until we recognise that it is the very political Power system that DK wishes to use that gives the Money system its legitimacy, we are doomed to tread the treadmill that allows mankind to rule over mankind, and some of us to be a little more equal than others. Putting this another way, and building up from the root . . . Authority was initially granted to mankind; we bequeathed that authority to evil; Christ gained that authority through His perfect sacrifice on the cross and sent the Holy Spirit who now has the authority to work wherever and whenever we give Him the authority to operate in our lives when we permit Him to. His nature is to give. His methods are to sacrifice. He seeks a hearing ear, a willing heart and operates through obedience. He avoids violence and political power (which is essentially force), instead is patient and gentle. He is gradually removing His restraining influence on world affairs and will eventually permit evil to implode in all its ‘glory’, a major event predicted in Daniel and the Book of Revelation when political and financial power will be seen for what it is as its implosion wrecks total havoc. Despite the signs of trauma ramping up, I suspect that this catastrophic event will be well after my time, perhaps decades if not centuries away, but come it surely will, as the Lord can be trusted to honour His word. There are some serious flaws with any position that includes the concept of voting (i.e. democracy) in God’s plans. The first is seen by way of examples – the real world. That the personification of evil in Britain, homosexual, plagiarist, drunk & criminal warmonger Winston Churchill pushed for it. That tells you a lot. So too did and does the banking fraternity. That tells you even more! There is a strong reason for this – democracy is the perfect tool for enslavement. People are deceived into worship of democracy by being given a vote – in return they are required to submit and receive compulsory taxes, enforced limitless usurious monetary systems, compulsory involvement in war and on and on. Dumb! The second is that it is totally contrary to God’s ways of doing things. Jesus showed us this – that He denied political power in His first test of His public ministry (even though He could have used it for Good) and this is a perfect lesson for us Christians today. He did that which His Father wanted because He had relationship. Unlike Adam & Eve who fraternised with the evil one, Jesus spent time with His Father. When He left, His followers acted in unity. There was unanimity as they KNEW Him. They did not vote. The concept of 51% rule is foreign to the Lord. The third is that voting is a prayer. When we submit to a system, we give our god-given authority to the rulers and [financial] leaders within that [democratic] system who can and do use it for nefarious purposes. Any decision by the people for the people is immediately suspect and polluted. There are godly soul-tie situations that occur for a season such as marriage, a parent-child relationship (until the age of maturity) and occasionally spiritually-based relationships but the majority of the time a Christian walk of faith is an individual one. Our accountability most certainly is, anyway! The evidence from mankind’s history is clear – replete with disastrous events the norm, the first lesson from conspiracy research is that deception lies at the heart of politics and banking. Biblical teaching, contrary to DK’s teaching, concurs. And what drives people to accept usury? Two things primarily: ignorance of the Bible teaching against it and the love of money which is “the ROOT of all evil”. No . . . it is pride. Money was not involved in the Fall. The original sin was pride. Man and his woman conspired to be like God. The sinful state of being resulted from pride and is the root of all sins [acts or omissions] such as usury which flows from this state of being. 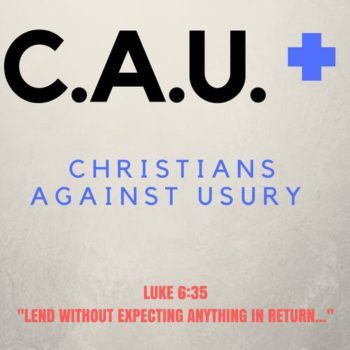 Usury is simply ONE of the multiple sins God lists and explains to be an enslavement technique, only permitted by the Israelites against their enemies. Another commenter in the same forum has [correctly] identified another. There are more. DK: And yet the Lord required of the ancient Israelites a vote of the people for the institution of God’s laws. Nonsense. He required nothing of the sort. He gave. He spoke, period. Israel’s ratification at one point in their history has zero impact or influence on me in New Zealand in 2018, just as Israel’s rebellion has none; nor the conduct of any of my forefathers, good or bad. I am responsible for my decisions in light of the Holy Spirit’s direct leadership & guidance today. I face my maker and reap the rewards of my conduct independently of any ratification, national salvation or otherwise. You obviously accuse us unjustly of worshipping democracy. No – correctly, not unjustly. Worship is a powerful word chosen deliberately, as is the word “idolatry”. DK lives in the USA and believes in the power of the people, democracy as established through the US constitution. His solution is to attempt to bring God’s ways through democracy – voting – effectively trying to use something ungodly to achieve godliness. He wants his Christian values included in the political power systems of his country and culture by way of a 28th Amendment to the US Constitution. Jesus had zero interest in political power. He chose to submit to it sacrificially because that is what His Father asked of Him. The religious power structure had conspired with the political power structure of His day to eliminate Him. That Jesus submitted was a choice. Worship though is the bowing down and belief in which is what DK shows. Jesus rejected this worship [lit: bowing down] in the temptations at the outset of His public ministry. How else can God’s laws become the laws of our lands except we vote yes for them? It can only be done by ratification of the people. God does not need ratification, nor “laws of the land” for His Words to exist or have validity. He speaks. Period. As I said, ratification by the Israelites at one point in time is a total red herring. Shortly following this unity there was not unity. Is the ratification therefore still valid? No. Homosexual marriage runs contrary to His word yet is increasingly legal across the globe. Does this change anything? No. DK’s “laws of the land” have no influence on His Word. DK elevates the “laws of the land” unduly, IMHO, as he does not understand how the issue of authority applies to democracy & the charging of usury. This is simply one group of people responding to the Word of God. Ninevah did the same. Noah likewise responded positively to Him. Various leaders and families did the same and have done for eons. They still do. DK: And just how does anyone go deeper than working toward the institution of God’s laws? You park your personal agenda (well-meaning and important though it is) actually listen to what I say, think and apply logic. When something is unclear or contested, you ask questions so that you understand what the dissenter is trying to say. When you can summarise their position accurately then you can say that you have “gone deeper”. Take another contentious subject – the Holocaust. Most in the USA accept the Holocaust story as dished up ad nauseum. Going deeper doesn’t require hatred of Jews; it simply requires us to ask questions and know the core issues that revisionists raise. When one has “gone deeper” one will know the three planks of dissenters’ concerns. Likewise with my disagreement with DK. Repeating a proposed solution (no matter how seemingly good or constructive this may seem – nor how firmly it is believed) does not “go deeper”. It is a fact that we are under instructions from Jesus to “Let the wheat and the tares grow together until the harvest”. We are thus faced with a formidable task. The task is not yours DK. It is the Holy Spirit’s. Teach, by all means. Ask questions and live your life as you know is required of you again by all means, but it is not your responsibility to take on and fix the world. Jesus taught to focus on what is in front of us, letting Him outwork His magic when and how He wants. Separating is His job. Not ours. But any meaningful change cannot occur until righteous financial laws are in place. No. This is nonsense. I lived in Samoa for years and never had a bank account and participated in largely non-usurious living. Again in NZ, while it requires more work than going with the flow, meaningful change can occur once we understand, and as I say hear and obey. Righteous financial laws have an influence on society of course, but believing what DK does sets him up to teach falsehood. Laws are ignored or (as he has said elsewhere) perverted, no matter how godly they are when people so choose. Global consciousness change will occur with mass learning following collapse of an ungodly system which is the opposite of what DK teaches. Trust Him. He knows best. Once done we see financial oppression and exploitation of the poor evanescing because the usury and oppressive taxation can remove 65% out of retail prices for goods and services. Look to the Islamic world and how they circumvent their own prohibition of interest. Laws will do nought for a people determined to be like God and go their own way. Indeed elevating laws of the land empowers those who write them to use them for their benefit. Most of all, we are opening up dialog in order to undo five centuries of neglect with Christian teachers’ silence and outright heresy about finance. Correct, and dialogue is valuable but still usury is a single dimension issue, one of many, held out to be the root cause by DK when it is not. I repeat, the falsehood of DK’s teaching is that usury is the root. It’s not. Pride is – the desire to be like God. To have our own way; rebellion. The sad thing for me is that CAU has a valid point about teaching biblical finances, and the exposure they will be bringing to the marketplace (especially in the Christian community) is more than welcome but their two primary errors depower their work and lack wisdom. These errors are: a) They teach that usury is the root of evil when it’s not (although it is certainly the primary tool of enslavement); and b) They do not understand nor teach the authority by which evil gains a foothold in our lives – through the ungodly concept of democracy. If you don’t get it yet, we are Christian’s Against Usury. If you prefer participation in this group then agree with those who seek the institution of Christian laws. I am a Christian and I understand and teach that usury is prohibited in scripture. Requiring those who participate on your/their Facebook group to agree with you/them 100% shows the true nature of the leaders. I provided commentary and analysis using direct quotes from a book that DK wrote that I purchased, plus comments from the UAC Facebook materials & commentary. To date the core issues I raised have not been addressed correctly nor meaningfully. Having Christian laws in place would provide the promised life, liberty and property for all, not just Christians. Could, not would, but won’t! You do know what Jesus taught about lawyers and their escape clauses? To frame your arguments in a lawyer-like fashion may very well mislead the weak-minded. Those who seek and deal in the truth can handle dissenting opinion. Truth is obtained by first enquiry and then by the application of logic onto fact. Call this legalistic if you wish however for one who seeks to use the “laws of the land” to enforce the non-usurious practices of the population (of the USA) and suggest that one who dissents defers unduly to the power of law is a bit rich IMHO. Authority is the key subject I ask DK to dive into. By what authority does his “laws of the land” have affect upon me, or you, or himself? By the authority of democratic systems. He votes because he believes that this is the best way, yet it is not God’s way. The enemy understands this and accuses because he has the authority to accuse. Authority bequeathed to evil through voting empowers evil. I do not vote and reject the authority that any system claims over me due to DK’s actions or those in my country who do vote. You ought to be careful. We all know the root is lack of faith in God. No, it is pride and you have taught in error that usury is the root (which triggered my post), now “lack of faith” supposedly is. Lack of faith is not the issue at all, it is pride that caused their rebellion. Adam and Eve knowingly chose to do what they did. They knew full well what they were doing (llok at their guilt when confronted) and traded their authority for the deception that they could potentially see as God could. They paid the price by entering into that poisoned transaction, the same as we do today. He therefore allows those who lack any faith to believe delusions. But those of us who have carefully looked into these matters believing God are now able to demonstrate how successful an economy could be under the institution of Gods righteous financial laws. Yes, any economic system based on Mutual Credit run honestly brings blessing. I do urge you to read our American Constitution that already is supposed to take us to the blessings enumerated in Deuteronomy 28. I do not live in the USA. I am not subject to the “American Constitution” [BTW don’t call it that in the presence of South American people or they’ll resent your arrogance and offensive use of the term “American”]. The Samoans have a social system that mirrors God’s social justice much closer than the “American” one but this has nothing to do with what I have taken issue with in your teaching. The Aborigines have a relationship with the physical world that puts the Western world to shame. So what? The “American Constitution” clearly means a lot to you but it means little to those outside of your country. I ask of you the following: do you believe in observing the laws of the land? Have you as yet discovered in the New Testament that which the Apostles taught about keeping the laws of the land? Of course, but like Jesus did, this is a choice. For me, first always comes God’s laws in the light of revelation of the Holy Spirit. Blanket automatic subscription to observing the “laws of the land” is submission that bequeaths power to evil. That I will not do. I wrote a book called Corruption in Samoa and it resulted in a corrupt and cowardly Prime Minister and his corrupt officials breaking their own laws to evict me from Samoa, resulting in a total loss. That’s taking on TPTB – big time. Prostitution in now legal in my country as is homosexuality. Does this legitimise an act before God? Not for me it doesn’t. Why did the early Christians end up being fed to lions if their faith didn’t unsettle TPTB? The point is that some engineer the writing of the “laws of the land” to control others for personal benefit. We as Christians have the responsibility to obey Him first. Please understand that the authority that TPTB have to enforce their laws comes from you . . . if you vote. THIS is the key, not whether we should obey them, nor what they are. I appear to have been unsuccessful in attempting to encourage you to dig deeper. Jesus told us to render unto Caesar. In America our Constitution has a clause in Article 1 Section 9 prohibiting any title of nobility for citizens and elected officials. We have thus already removed observing Caesar’s financial laws in the United States of America. But by hook and by crook shylocks have found legal ways to keep America’s people financially enslaved. This has all been possible by circumnavigating almighty God’s financial laws and because the people have not been taught about God’s financial laws by the so called Christian Bible teachers. At the same time, the American Constitutional guarantee for life, liberty and property of the people has been violated by the allowance of usury and by the allowance of financial oppression both of which are contrary to God’s law. If/when you remove your worship of democracy and over-inflating of the importance of laws of the land, then you can easily see your stupidity as a nation and your personal failure in logic. Maintaining a position based on belief in something immoral and accursed like democracy is not my way. And since almighty God required in ancient times a vote of the population to make His laws the laws of their land, and since He took particular care to mention sheep and goat NATIONS in Matthew 25, then it stands to reason that He is a God of laws and of nations as well. And within His proclamation of salvation in this dispensation of grace – salvation freely given by Him – there is both personal and national salvation available. Ratification occurred once. Great! Going to the next step however in saying that it was required, is a logical failure. Taking it still further into the concept of a “National salvation” is another issue and one that is a theological argument. This is a narrow theological position and contentious. I do not accept it. All we need to do is observe all His commandments. You seem determined to avoid this national salvation. Not avoid – disagree. I teach against the concept of “national anything”, in theory and see it as a nonsense in practice. Jesus came to seek and save the lost. He rejected political (and religious) power, totally ignoring the entire political system. He worked His magic within, under and through the political leaders of the day. When godliness descends, nations will dissolve as we understand Him more and more. Please define nation – is it political or racial or spiritual? My children are half Maori. I am Caucasian. We were all born in New Zealand. New Zealand is a political and legal construct with dissenting sectors of society. What is that nation according to your take? My current wife is Samoan and born in Samoa a nation that claims to be “Founded Upon God”. Now what? Are we all in or out of this salvation? Nations, like marriage and race mean ‘zip’ in the whole scheme of things to the Lord. Relationship though does. Woe are we who refuse to teach these truths. Woe are those who pit themselves against those whom God has sent forth to teach His truths. Woe is me then, according to you. We therefore observe God’s laws individually in order to accept personal salvation; and in order to observe God’s laws nationally it is necessary to ratify His laws democratically. In DK’s world, yes. In mine – nope! To infer that we worship democracy because we work toward the institution of God’s laws at a national level is certainly a delusion of yours. Worship in the sense of belief in, adoration of or reverence for democracy, yes! DK does not accept that others can be right, thus agreeing to disagree and retaining relationship is hard. Do you have faith in God? Then have faith in the words He and His apostles have given us. So my ‘faith’ differs from yours in the subjects of contention. DK has a belief system and requires those that he engage with to concur. First. I disagree. Secondly I do not concur with the thinking process the reaches DK’s conclusion. Thirdly it is not relevant to me whether the USA has godly laws or not. A true understanding of usury requires us to understand the means by which usury has its power – i.e by what authority can it and does it exist? DK puts an overly high weight upon political power, design and obedience of secular laws and democratic systems and ends with defending error. Apart from the subject of this post, and the subject of our difference, there is the method of communication to consider; plus the application of logic. I can agree to disagree. The thrust of my blogging is to go deeper, not so much to correct theology. The authority that TPTB have to enforce usurious monetary systems comes from adherence to the concept of democracy, power to the people. When we vote in a democratic system, we are voting FOR that system, believing that it has the solutions, thus it is a spiritual event, literally a prayer. TPTB know this and use that authority to enforce the laws that they write. The alternative to this is a refusal to bow down to the democratic system, allowing relationship to grow and mature through direct obedience to the Father. The revisionist vocation is a re-visioning of every human belief in the face of new information when it contradicts the old. Daniel Krynicki, IM[not so]HO your defensiveness causes you to fail in logic. You err more than once and do not fully understand that which you teach. 1. Usury is not THE root of evil. It is ONE manifestation of evil. You teach a falsehood. 2. You elevate democracy unduly and while it has been actively promoted in the last couple of hundred years to the point that it has become normal in the West, it is not biblical; it is nowhere endorsed in scripture and is accursed. Call this idolatry, worship by the gullible or normal, it doesn’t change its core nature – mankind going mankind’s way. 3. You utilise ad hominem attacks and talk in generalities rather than deal with the specific issues I raise. In this regard lists of irrelevant scriptures do not validate a falsehood. Neither too does a Preface written by a respected historian/author. If Michael taught the same (which BTW he never has done, either online or in his book), I would challenge him too likewise. Nor does closing down criticism by evicting a dissenting voice from a Facebook Forum! I respect your efforts at writing a book but if there is error contained and you cannot accept this possibility, then you are simply an arrogant author – in other words, “I’m right and you are wrong!” I’ve written 23 books but this means diddly-squat if I’m not prepared to listen and learn from detractors. The way I see is it that the cause of your errors are the translation of an example into a higher principle that contradicts His Word. For example, you use one example of unity within one country at one point in their history and call this ratification and then apply this as a principle, which is wrong. God’s Word does not need ratification. It stands. Likewise with the normality of democracy in the world that you live. Because the US Constitution exists, you assume (falsely) that this will be God’s tool for achieving godliness in your country. My original post encourages you to dig deeper so that you can understand. There is no crime in admitting that you were wrong, and correcting your position in the light of new thought or greater understanding. There is however potential for embarrassment and serious damage in doubling down on error if you utilise ad hominen attacks; avoid addressing the core issues raised; insinuate infiltration and perhaps bad motives. For the record, I am simply a Christian who has done the research, who thinks and has the b*lls to challenge others like you, who teach falsehoods. Thank you.